Cast: Hugh Jackman, Patrick Stewart, Halle Berry, Ian McKellen, Anna Paquin, Vinnie Jones, Kelsey Grammer, Famke Janssen, Rebecca Romijn, James Marsden, Shawn Ashmore, Aaron Stanford, Ben Foster. Brett Ratner's CV isn't the cleanest of documents. The inexplicably lucrative Rush Hour series (due a third instalment next year) props it up somewhat, hiding such uninspired nonsense as The Family Man and After the Sunset. It was therefore with some trepidation that I sat down in front of X-Men: The Last Stand, half expecting a series trashing as Joel Schumacher did to Batman with the naff Batman Forever and the stupendously awful Batman and Robin. I needn't have worried, this is comfortably Ratner's best ever movie - though lord knows there's not much competition there. Were it not for the slightly heavy handed pep-talk scenes and the subtle changes in character (Xavier now seems to actively dislike Wolverine, for example, and there are no qualms about killing the bad guys this time round), it could pass as one of Bryan Singer's own. All your favourite X-Men return - even the dead ones - resulting in a budget-busting cast list including a few newcomers. Hugh Jackman's Wolverine is once again the star of the show, commandingly stealing every scene with grizzly aplomb, and Ian McKellen continues to show why he's the blockbuster man of the moment as super-villain Magneto. Frasier's Kelsey Grammer joins the cast as Beast, though it seems no-one told him how to pronounce "Xavier", and Vinnie Jones contributes an amusing turn as minor X-Man Juggernaut. Patrick Stewart's heart doesn't seem quite in it any more, but fortunately there's more than enough going on to take your mind off it, with several simply stunning effect sequences that serve to thrill and inspire in equal measure. This movie's visual effects are integral to the plot - it couldn't have worked without them - and they're top drawer throughout. Testosterone Satisfaction Rating: 3/5 - great effects and Mystique's rubber suit. To enjoy this film you should be: eager to see how the trilogy pans out. X-Men: The Last Stand was released in the UK on 26th May. Well where does one start with X-Men III, it's different to the last two but it's the same story as you would expect that has a comic for it's base. In this, supposedly, last of the films we have a few new characters and a government department of Mutant Affairs headed by a certain Dr. Hank McCoy (Kelsey Grammer), aka Beast. Could it be that at long last Prof. Charles Xavier's (Patrick Stewart) goal is reaching fruition and we all get to live in harmony with our neighbors? In Xaviers school where Wolverine (Hugh Jackman) appears to have become a role model of sorts everything seems to be meandering along nicely until this kid emerges with a wonderful name of Leech (Leech by name and Leech by nature). Young Mr Leech (Cameron Bright), it would seem, has a body that produces an antibody to mutation; give it to an X-Person, and their mutant powers disappear (although I have to wonder how it would work on Wolverine, who is not really a Genetic mutant, but an experiment to make a super solider by adding adamantium into his skeletal structure). Now we have the basics of a story, all we need is the money and power to use Leech's 'gift' for the benefit of all us Homosapiens. Enter Warren Worthington II (Michael Murphy), who has a son called Warren III (Ben Foster) aka Angel due to a massive wingspan. A flashback shows young Angel in a room full of blood and feathers, having tried to cut the wings from his back. As a good father Worthington wants to 'cure' his son and this eventually leads our rich and powerful Worthington to buy Alcatraz, imprison Leech and begin to manufacture the antibody as a "cure" for mutation. Leech's anti-mutant powers are so strong that a mutant need only stand near him to lose his or her abilities; Mutant Cure Clinics spring up and are picketed by pro-Mutant militants. Now we get the basis for the mother of all battles. What if mutants don't want to be "cured"? What if they're happy with the way they are? Who are we to impose something on another life form? 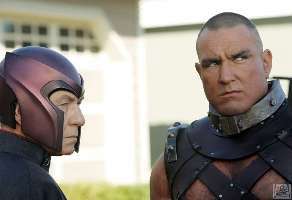 Forget the diplomacy of Xavier; Magneto (Ian Mckeller) takes a more direct approach and wages war against Worthington and all those who would impose a "cure" on the mutants. Although Magneto has always been the villain of the series, this time (in my view) he makes a good point. Here I digress a little. There are so many parallels with current political and social issues that to list them would take an age, however a couple would not go amiss. We have stem cell research and cloning. "Curing" mutants is obviously a form of genetic engineering and stirs thoughts of "cures" for many other conditions humans are born with. The fact is, most people grow accustomed to the hands they've been dealt and I for one would want to keep my originality (and I’m not perfect) rather than become more like the masses and less like myself. Back to the movie … The director Brett Ratner (Thanks Jimbo for the name) has tried to introduce too many new mutants in this ‘last’ movie and it’s difficult to place them all unless you’ve read the comics or seen the cartoons.. The addition of Beast, Angel and Leech, not to mention Multiple Man, Juggernaut (a well cast Vinny Jones) and the revived Dr. Jean Grey (reborn as Dark Phoenix) causes a Mutant Jam, because there are too many Mutants with too many powers for a movie that’s just over the 100 minute mark. Anyway I’m a fan of the comics the cartoons and the films. I enjoyed "X-Men: The Last Stand." I liked the action, I liked the absurdity, I liked the inconsistent use and misuse of mutant powers, and I especially liked the way it introduces all of those political issues and lets them fight it out with the use of fantastic special effects. Go see the film you won’t be disappointed.